Industrial mancooler fans and mobile air circulators. Sales of lagre commercial cooling fans, pedestal air recirculators, explosion proof air circilator mancoolers, wall and roof mounted air circulating fan ventilators. 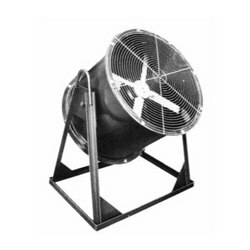 Canadian Blower OEM industrial fans, roof and wall exhausters, ventilating and air-conditioning equipment, pressure blower HVAC, heating ventilation and air conditioning, industrial process and OEM blowers. Axial ventilators in tubeaxial housings for high velocity air blowing used as man-coolers, drying and air circulation applications. The standard FRP resin used for the Canada Blower CBDF fan is resistant to a large variety of alkalis and other chemical agents. When a corrosion resistant fan is required to withstand chemicals which attack glass or polyester resin, special plastic and reinforcing material can be supplied.